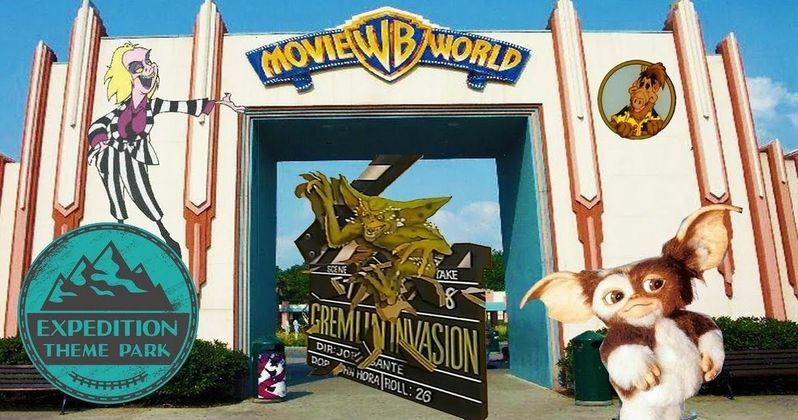 Australia's Warner Bros. Movie World opened in 1991 and it featured a Gremlins ride. It's not clear why we're all just learning about this now because this seems like some pretty huge news. If that wasn't enough, another Warner Bros. theme park opened in Germany, five years after the Australian park and it too featured The Great Gremlin Adventure. However, there were some key differences to both sets of rides and their respective countries that are pretty puzzling. The Australian version of The Great Gremlin Adventure ride starts off in a movie theater where parkgoers get to watch deleted footage and bloopers from Warner Bros. movies and TV shows. However, before the footage ends, Gremlins take over the theater and it's up to you to escape. The animatronic versions of the creatures look pretty awesome, but it's nearly impossible to escape, so Warner Bros. brought in an animatronic Beetlejuice to lead everybody to safety. Nobody seems to have any idea why the Ghost with the Most is included on a Gremlins ride, but it's just weird enough to be cool. The German version of The Great Gremlin Adventure ride is pretty much the same thing, except it has a different intro and Beetlejuice isn't there to help you. Instead, the German version of the theme park enlisted ALF, aka Gordon Shumway, from the hit American TV series of the same name. Before the ride begins, ALF tries to hunt a cat and reaches to grab one, but a Gremlin attacks him instead, so it's up to the parkgoers and ALF to find a way out to safety. Beetlejuice was a pretty odd choice to help escape the Gremlins, but ALF seems like an even weirder choice. However, upon some further research, it appears that Gordon Shumway was pretty huge in Germany and was a popstar for a short amount of time. The man who did the German voice of the alien is Tommi Piper and he released two albums as ALF, which spawned 4 top ten singles. So, it makes sense that the cat-loving alien from Melmac was there to help the tourists make it out of the park alive. Maybe David Hasselhoff wasn't available? Both Warner Bros. theme parks in Australia and Germany didn't last very long, so it makes sense that a lot of us in North America didn't know about the excellent Gremlins ride until now. Thankfully, there is some video footage of both rides, featuring Beetlejuice and ALF, which should give you a good idea of what we all missed out on in the 1990s. One has to wonder why the Gremlins ride and the Warner Bros. theme park never made it out to other areas of the world. A Gremlins ride would more than likely be met with open arms at this point in time. You can watch footage of both rides below. Thanks to Alex Pardee's Twitter account for finding these gems.